Take advantage of your digital footprint to demonstrate your skills and experience. Digital identity is the online presence of an individual, including social media presence, profiles and engagement, and any discoverable online content. Professional nurses and nursing students should consider what their digital identity says about them. A well-developed electronic portfolio can successfully create a positive digital identity by articulating professional goals and experiences, highlighting unique skills sets or achievements, and connecting with other professionals who may lead to new opportunities. Your online identity (including photos you post on Instagram, status updates and likes on Facebook, and Tweets) is a digital fingerprint that reveals who you are, personally and professionally. And because an estimated 60% to 80% of employers do online searches of potential hires, your digital identity should not be taken lightly. Both students and practicing nurses should attend to their digital identities to ensure that they’re seen in a positive light by potential employers, academic institutions, colleagues, and patients. 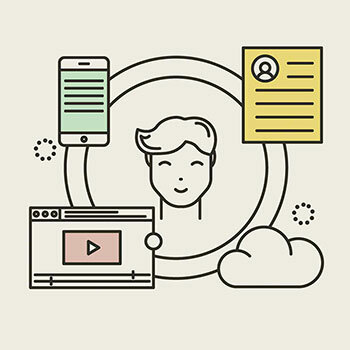 To build your ePortfolio, consider the platform you want to use, how you’ll connect with other nursing professionals, and the content you should include. An ePortfolio, and the process of creating one, offers many benefits to students and nursing professionals. Here are just a few. • For practicing nurses, reflecting on your experiences and skills will help you determine how prepared you are for the positions you’re seeking. • For new graduates, reflecting on clinical and professional growth since admission to a nursing program and outlining short- and long-term goals will aid in building your career path. • In some disciplines, ePortfolios are a well-established practice to demonstrate progress, archive coursework through college, and provide evidence of meeting learning outcomes. • The process of building an ePortfolio can support preparation for academic applications and professional interviews. • Many employers still require traditional résumés, but ePortfolios are an innovative way to share your experiences and skills. Before you start creating your ePortfolio, decide what platform best suits your needs. If you’re a student, your school may offer free access to platforms such as Portfolium or Pathbrite. Reach out to your career services center to find out if these options are available. Other platform options, for both students and practicing nurses, include social media and sites that allow you to create your own website. LinkedIn, for example, is a social media platform designed specifically for building career profiles and making professional connections. The downside is that it doesn’t allow for design flexibility; your portfolio will look like everyone else’s. No matter which social media platform you use, take advantage of opportunities to connect to professional organizations that align with your career goals. Another option is creating your own website, using platforms such as WordPress and Google Sites. With your own website, your ePor­tfolio will be unique in both design and function. Some website-building platforms are easier to use than others, so keep that in mind when making your choice. Networking has always been important to professional growth, and the digital world makes it easy. One way to connect with other nursing professionals is to identify relevant online articles or blogs and share your perspectives on social media. If you’re starting a job search, follow organizations that interest you and interact with them through social media by commenting appropriately on their activities and initiatives. Recruiters and potential employers will view your ePortfolio in different ways. Some may click one or two links, while others will take time to explore it. You’ll want the content on your ePortfolio to be easily accessible, so that in one click viewers have an immediate representation of you. (See What should be in your ePortfolio?) And whatever platform you use, familiarize yourself with its privacy settings to ensure the security of the information you share. What should be in your e-portfolio? Your ePortfolio should give potential employers a full picture of who you are as a nursing professional, whether you’ve been in practice for years or are a recent graduate. • Provide basic information, including your name, education, certifications, and contact information. • Include your professionally taken photograph so employers have a visual representation to connect with. • Embed a clean, edited résumé (or the content normally found in a résumé) with the option to print. Include certifications and related work experiences. • If you have permission, include references with contact information. If not, simply state that you can be contacted for references. • Outline your short- and long-term goals. Consider developing a nursing philosophy statement. • Include organizational and volunteer experiences. If you’re seeking work in a specific field, such as pediatrics, highlight your experience and volunteer work with pediatric populations. • If you’re a student, share your clinical experiences. Include facility names, units and departments to which you were assigned, clinical rotation and course hours, projects in which you participated, and electronic documentation systems you used. • If you’re a practicing nurse, include information about your clinical positions, leadership roles (both formal, such as nurse manager, and informal, such as chair of the unit patient safety committee), and research and quality-improvement projects. • Include examples of experiences that demonstrate leadership, communication skills, and teamwork. Many advanced-degree programs integrate the development of ePortfolios into coursework, but they can be developed at any career stage. Building an ePortfolio provides opportunities for professional development, critical reflection, and lifelong learning. Digital connections may enhance your knowledge in areas such as healthcare policy, current healthcare trends, and research. Imagine a potential employer searching your name online and finding information about your academic and professional experiences, your career goals, and your digital connections in your ePortfolio. Isn’t that better than finding random images or posts from social media, or even worse, finding nothing? Traditional résumés may still be the common method of submission for job applications, but fast-paced technological growth indicates that ePortfolios may soon be required, so why not be ahead of the game? Jaime Hannans is an assistant professor of nursing, California State University Channel Islands, Camarillo, California. Yosemite Olivo was a student at California State University Channel Islands at the time this article was written. Ainsa T. College students’ digital identity: Perceptions towards employment and career. Coll Stud J. 2016;50(1):47-52. American Association of Colleges of Nursing. The Essentials of Baccalaureate Education for Professional Nursing Practice. 2008. Garrett BM, MacPhee M, Jackson C. Evaluation of an eportfolio for the assessment of clinical competence in a baccalaureate nursing program. Nurse Educ Today. 2013;33(10):1207-13. Karsten K. Using ePortfolio to demonstrate competence in associate degree nursing students. Teach Learn Nurs. 2012;7(1):23-6. O’Keeffe M, Donnelly R. Exploration of ePortfolios for adding value and deepening student learning in contemporary higher education. Int J ePortfolio. 2013;3(1):1-11. Anxiety attack or myocardial infarction?